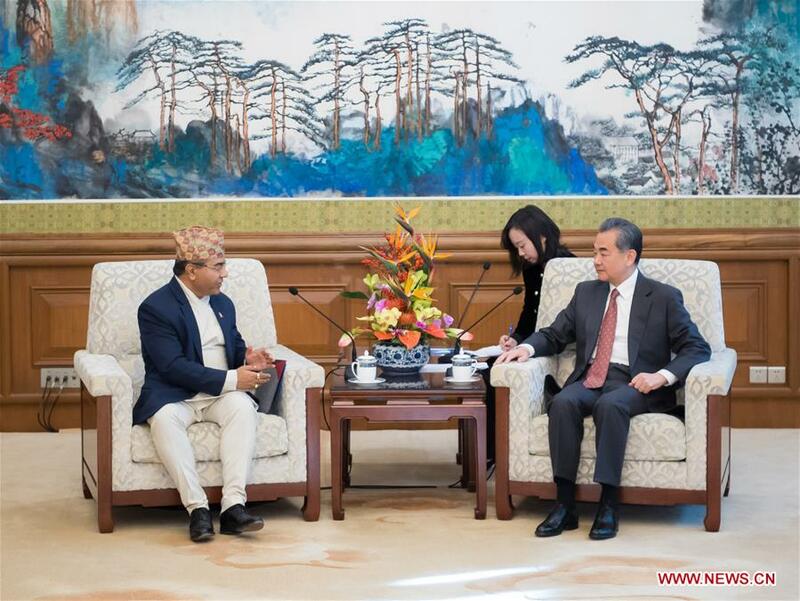 BEIJING, Dec. 13 (Xinhua) -- Chinese State Councilor and Foreign Minister Wang Yi on Thursday met separately with Shanker Das Bairagi, Nepal's foreign secretary, and Rahamtalla Mohamed Osman Elnor, first African Union (AU) representative to China in Beijing. When meeting with Bairagi, Wang said China stands ready to continue working with Nepal to enhance high-level exchanges and welcomes Nepali leaders to attend the second Belt and Road Forum for International Cooperation to be held in China next year. China is ready to provide support for Nepal's national stability and development within its own capacity, he said. Bairagi said Nepal adheres to the one-China policy, attaches great importance to the Belt and Road Initiative and hopes to enhance high-level exchanges between the two countries and carry out all-round friendly cooperation. When meeting with Osman, Wang welcomed the latter to assume his new post in China. As building the Belt and Road comes in tally with the AU Agenda 2063, it's imperative for China and the AU to work together in exploring the potential for cooperation through jointly advancing the Belt and Road Initiative, Wang said. China hopes that the AU and its representational office in Beijing play a positive role in promoting the overall cooperation between China and Africa as well as the Forum on China-Africa Cooperation, said the State Councilor. For his part, Osman said that developing strong ties with China represents the consensus of all African countries. AU supports China in building the Belt and Road, and the cooperation under the initiative is in line with the development goals and interests of Africa, he said.